AverLogic Technologies, the video processing IC and specialty memory design company and available through Glyn High-Tech Distribution , has introduced its high-performance FIFO (First-In-First-Out) field memory chips. The FIFO (First-In-First-Out) field memory chips are designed to buffer audio/video/graphic digital data for a wide range of applications such as video capture or video editing systems for NTSC/PAL or SVGA resolution, security systems, scan rate converter, PIP (Picture in Picture) video display, timing correction, format conversion, multimedia systems, buffer for communication system, and DTV/HDTV video stream buffer. The AL440B FIFO memory provides completely independent 8bit input and output ports that can operate at a maximum speed of 80MHz. The built-in address and pointer control circuits provide a straightforward bus interface to serially read/write memory that can reduce inter-chip design efforts. Manufactured using an advanced embedded high density memory cell array, the AL440B FIFO memory uses high performance process technologies with extended controller functions (write mask, read skip, window mode read/write, etc. ), allowing easy operation of non-linearity and regional read/write FIFO for PIP, Digital TV, security system and video camera applications. Expanding AL440B data bus width is also possible by using multiple AL440B FIFO memory chips in parallel. The 4Mbits AL440B is configured as 512K x 8-bit FIFO to accommodate NTSC, PAL or up to SVGA resolution. Running at high speed (80MHz maximum) and low power consumption AC characteristics (3.3V power supply) allow the high performance and high quality application capability for designs such as HDTV. The AL422B consists of 3Mbits of DRAM, and is configured as 380K x 8 bit FIFO. The high speed and low power consumption are achieved by using 0.35 micron process technology with embedded EDO dynamic memory. The interface is user-friendly, since all complicated DRAM operations are already managed by the internal DRAM controller. The AL422 can accept either 3.3V or 5V power with slightly different external configuration. Current sources of similar memory (field memory) in the market provide limited memory size, which is only enough for holding a TV field, but not enough for a whole PC video frame, which normally contains 640x480 or 720x480 bytes. 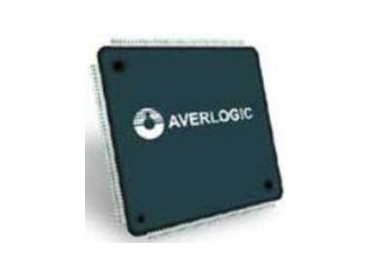 The AverLogic AL422 provides 50% more memory to support high resolution for digital PC graphic or video applications. The 50% increase in speed also expands the range of applications.